Belgium Self-Drive Driving Holidays. Belgian Hotels and Accommodation in Belgium. Channel Crossings with Drive-Alive. Welcome to Drive-Alive Self-Drive Holidays in Belgium. Motoring holidays in Belgium, Driving Tips and Tourist Information for Belgium. Everything for your holiday in Belgium all on one site. Belgium may be a small country but it more than makes up for that with a great variety of scenery and very friendly inhabitants. The North Sea coastline has some of the best beaches in Northern Europe with mile upon mile of firm sand perfect for building sandcastles or trying your hand at a spot of sand-yachting. Inland, the country is split into the French speaking south and the Flemish speaking north. Some of the oldest and best preserved cities in Europe are to be found in Belgium. 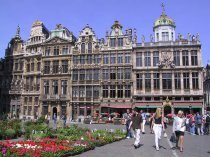 Brussels, the capital, is a lively and sophisticated city, while Antwerp houses one of Europe's oldest Universities. Bruges is famous for its canals and elegant old buildings, and is at its prettiest around Christmas. The battle-fields of Flanders are a site of pilgrimage for many who lost relatives in the Great War, while the wooded valleys and mountains of the Ardennes offer great walking and cycling. More tourist information for Belgium. Search and book hotels in Belgium. Find self catering apartments and holiday homes in Belgium. Car hire in Belgium: If you fly check our car hire. Fantastic rates on a wide range of vehicles, available from your destination airport.